Everyone, I have to apologize for the lack of posting this past week and a half. We’ve been completely busy with various schoolwork/activities which has put a damper on the amount of time to post. Also, most of our cooking has been in the evenings or for guests so I haven’t had a chance to get pictures. Hopefully this weekend we’ll be able to try out some new recipes to share with you! Anyway, I also need to apologize for not sharing this sandwich sooner. You see, taking pictures of it seems to be a bit…cursed. The first two times I made it, the sun went down just as the sandwiches were ready to serve (I only shoot with natural light). The next time, I was saving the last sandwich I made to photograph, and I burned it (such a juvenile cooking error, I know, but sometimes I get distracted). This time, the bread was supermarket sourdough without much character and it wouldn’t get crispy, no matter how long it was cooked and no matter how much color it got. So that explains the floppiness in the picture (which, typically, I did not notice while photographing). Feeling hungry yet? However, this sandwich needs to be posted about, no matter how the mediocre the picture is. This sandwich is amazing, regardless of the road bumps it had to weather on its route to becoming a blog post. Onions are caramelized in butter and olive oil for maximum flavor, seasoned with thyme and beef stock (or white wine if you’re vegetarian, or if you just like wine! ), and spread over bread. The whole thing is topped with Gruyère cheese and pan-fried. It is absolutely delicious, and ideal for cold winter days. Better yet, it is much quicker to prepare than real French onion soup, making it practical for any night of the week. We hope you try it! Also, in case you were wondering what the words were on the plate in the picture, it’s part of a Christmas plate collection that has phrases from ‘Twas the Night Before Christmas on it. When onions are entirely browned and completely soft, add beef brother or wine to the pan. Scrape any brown bits off the bottom of the pan as the liquid evaporates for about 30 seconds. Remove pan from heat. Butter one side of each slice of bread. 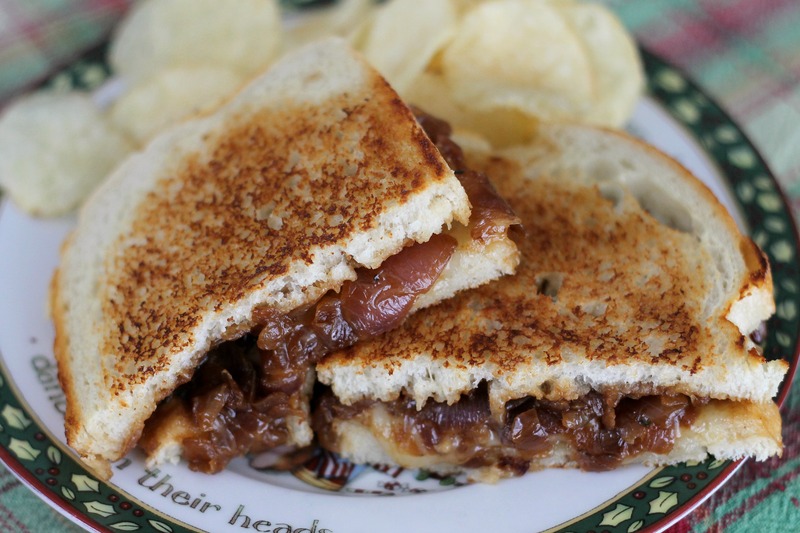 Sprinkle the un-buttered side with Gruyère, top with caramelized onions, more cheese and the second piece of bread. Repeat process in assembling the other sandwich. Cook sandwiches over medium heat in a saute pan. Cook until both sides are golden on the outside and the cheese has melted. Serve immediately while hot. Enjoy!